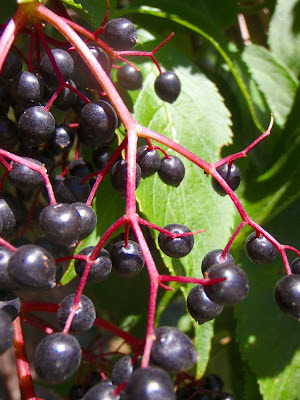 It looks to me like elderberries are one of the most wildly foraged foods (if I were to judge by blog posts about it). Before this year, I had no idea how to identify it. Gotta say, I felt a little left out. But now that I know how to spot it's serrated leaves and drooping purple berries, I'm all about elderberries (Sambucus spp). For almost a solid month now, I've been taking my bike over to the three trees from which I harvest, and filling up my panniers. And how could I resist? 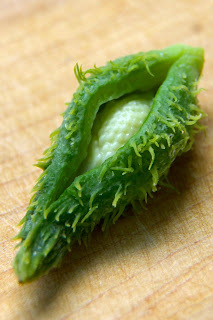 This little berry has been prized for it's medicinal value for ages, and it tastes great in cooking, too. What's not to love? 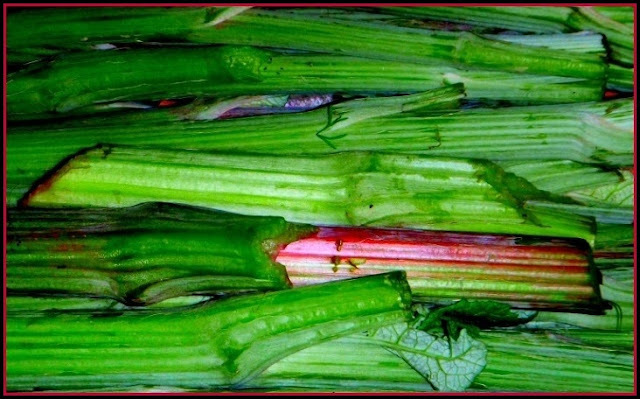 For cooking, elderberries can be used as you would any other berry. 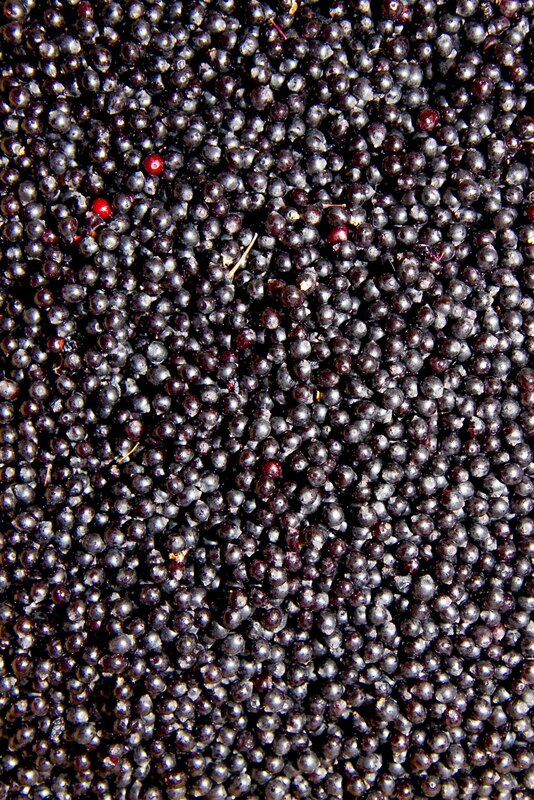 Unlike some other forages, like chokecherries or currants, elderberries are mild and tend to be sweet. So add them to bakes goods, whip up a batch of jelly, use them in meat glazes (my favorite), or make a traditional elder syrup. And while you're busy cooking up a storm with elderberries, be sure to put some up for medicinal purposes. Elder is one of the greatest allies to your immune system, and is invaluable to your home medicine cabinet. Let some of the berries dry for tea, or put them into a mason jar with spirits and honey to make a fine elixir, and you'll be well prepared for cold and flu season. To read more about the medicinal benefits of elder, please visit my friend Fairybekk at Cauldrons and Crockpots, where you can find the recipe for making elderberry elixir and read a more detailed explanation of it's medicinal benefits. Wow, this sounds great. Where does one come upon elderberries and can a plant be bought? Great post and I definitely would buy a plant just to try the berries. Thanks, have a great weekend. Hi Gloria - My father, who has picked elderberries since he was a kid on the farm, swears that they grow best in hedgerows. But if you've got a yard, I'm pretty sure you could purchase one to grow there. And I've also heard of people buying elderberries at the farmers market. I have certainly never seen elderberries before but now, after reading this, I definitely want to! They sound delicious. Thanks for the response, I appreciate it. In fact the farmers market is open today, maybe I'll go have a look. Thanks again. Now, you're making me want to go look for some! No problem, Gloria. You'll love these berries if you can find them! Pam - Give it a shot! Then may be growing in your area. And the flowers can be used for both food and medicine, too. On a side note, I saw dried elderflowers in the herb section of my Latin grocery today. When I was in Munich, I had a pie-type thing that was made of an Elderberry paste and I believe it had meringue on top. Wow. Incredible.